It is strange to admire objects of war and violence as aesthetic objects, but when they are as beautifully formed as the works in The Art of Weapons at the Hood Museum of Art, it becomes too easy to separate artistry from use. 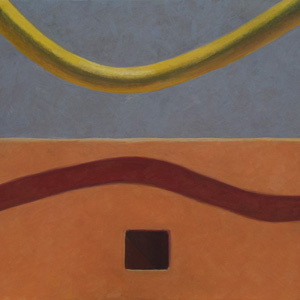 On view are highlights from the museum's extensive holdings, which were collected during the late 19th to early 20th century, the age of colonization, which brings up other moral questions. But....I'd like to simply admire the fine craftsmanship and elegant design of these works. The knife above, with its sweeping curve punctuated by open circles, is a study in motion (but as I say that I see it sweeping through the air towards its destination); there is an interesting contrast between the fine blade and the rounded handle. 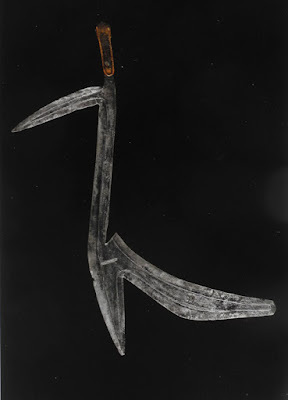 Fang or Kota people, Gabon, Bird-headed ceremonial knife. 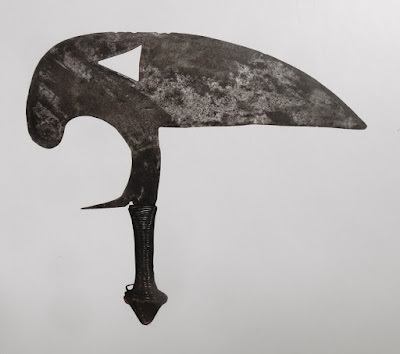 This is a marvelous abstraction of a bird, its huge beak becoming a blade. 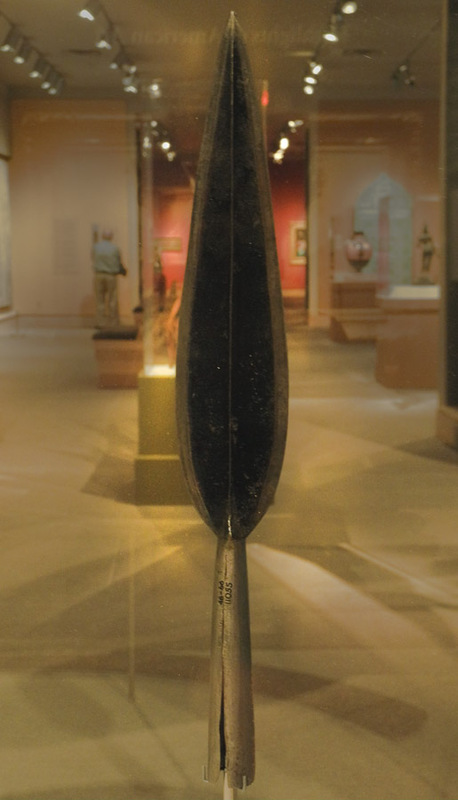 From the exhibition catalog, I learned that ceremonial knives were used "in ritual and ceremonial contexts, such as rites of passage that involved circumcision, and as a protective charm against anti-social forces". The swelling form of this blade contrasted with the wire-wrapped wooden handle is very beautiful. The darker shape at the center creates a repeated rhythm. 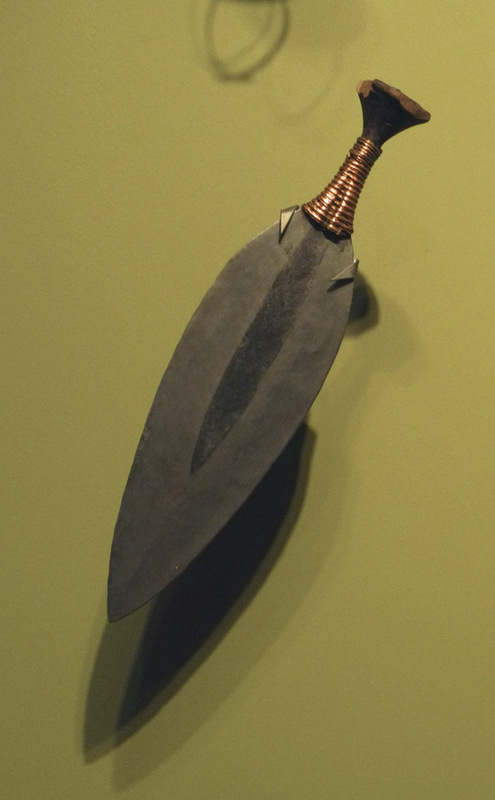 Kuba people, Democratic Republic of Congo, Ceremonial Knife. 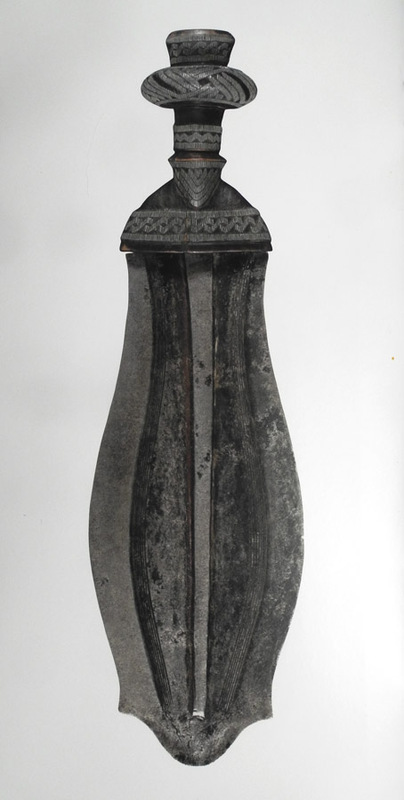 This ceremonial knife is known as an ikula. It would have been worn on the right hip by free men in Kuba society, denoting high rank. Reading about this knife in the catalog, I was amazed to find out that the complex wooden handle is inlaid with wire to form the patterns. This is craftsmanship of a very high order. This is an unusual shape, with metal blade perfectly integrated with its wooden handle. 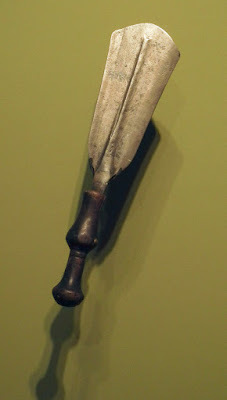 Bwaka or Gobu people, Democratic Republic of Congo, Throwing knife. 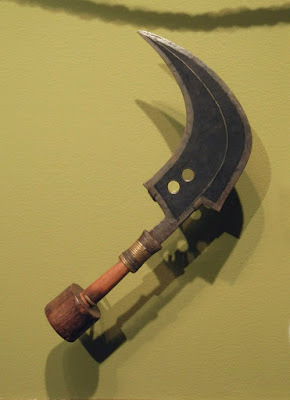 This is quite a brutal weapon when thrown at a foe; its complex form added to its deadliness. Throwing knives were highly valued, "used as currency for commerce and as a symbol of political office or social status". I look at this spear and have a deep sense of satisfaction: the shape seems to me to be perfect in its proportions; the relationship of height to width, the gentle swelling outlines, the central light vertical line, combine to make something that seems an essence of form. 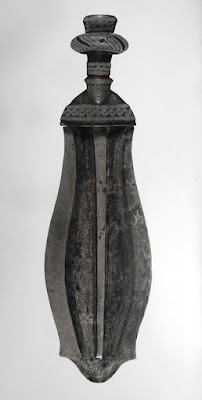 The exhibition also included defensive weapons, such as shields. 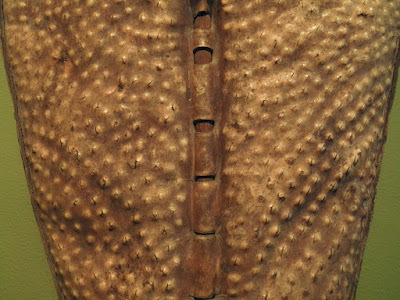 The large leather shield above is remarkable for its pattern of bumps, which create a linear design within its long curve. 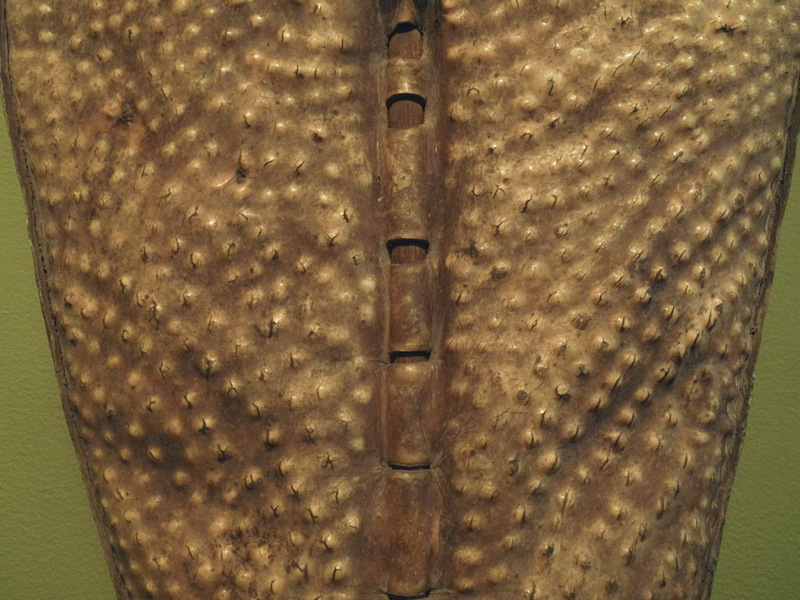 I don't know how these small protrusions were created, but they do make a lively and interesting surface. African weapons are emblems of authority, social rank, ritual commemorations, royalty, strength, identity, divine power, life, and death. 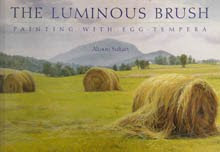 Thanks for sharing these images of artfully-sculptural tools. The mere presence of weapons can be a wonderful deterrent, or "charm" against anti-social behavior, as evidenced by the mass-murders being committed usually in "gun-free zones". Using the word "tools" makes these weapons more everyday than they are, don't you think, JBS? I suppose you're right, though I use just-as-sculptural tools every day. Deterrence, as in "pain is a good teacher". I have always had a fascination with knives. These are most unusual. They are quite unusual, and this is just a small sample. Thanks for looking, Lisa.